3. Ride bike between the two. Sounds easy. It is really. We love riding our bikes, and this trip is just going for a bike ride somewhere new every day. What’s not to love? If you keep going in the same direction, and do it for a long time, you can get quite far. Across a continent even. But we made quite a basic mistake. In our eagerness to ride, we skipped step 2 and rushed ahead with step 3. Our end point was always “somewhere on the Washington coast”; as we got nearer it became defined as the small port town of Anacortes where we would celebrate with a beer before catching a ferry to explore the San Juan Islands at a slow pace for a few days. Great plan. However we looked at a map and realised that Anacortes is not west facing, so it not at “the end”. This would not do. It is however situated on a peninsula with a west-facing coast, so that was our vague end point. But even that didn’t quite go to plan. We only had 20 miles to ride on our final day, leaving plenty of time to find a decent spot, dip the wheels in the Pacific Ocean (we had a ceremonial wheel dipping in the Atlantic in Boston) and maybe even spend the afternoon relaxing. After the hard ride across Washington we were very excited about this plan. 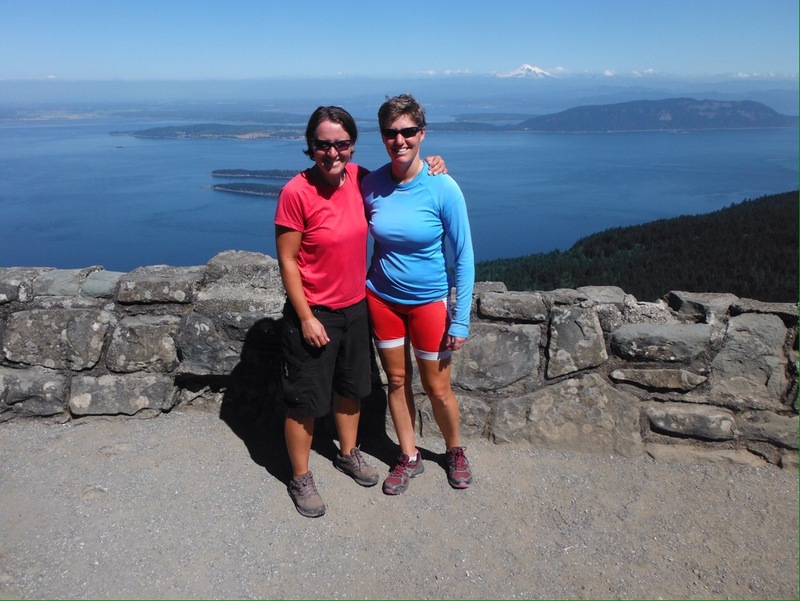 We looked at the map, and realised we could ride a slightly longer route via Deception Pass, a famous high bridge with decent views out to the ocean. This might even fit our requirements for a West facing end point. With only 20 miles to Anacortes, what would be the harm of a little tourist detour? We had all day after all. So after a long leisurely breakfast in Burlington we rode the flat route towards Anacortes and then turned off towards Deception Pass. Uphill. On a fairly narrow, busy road. 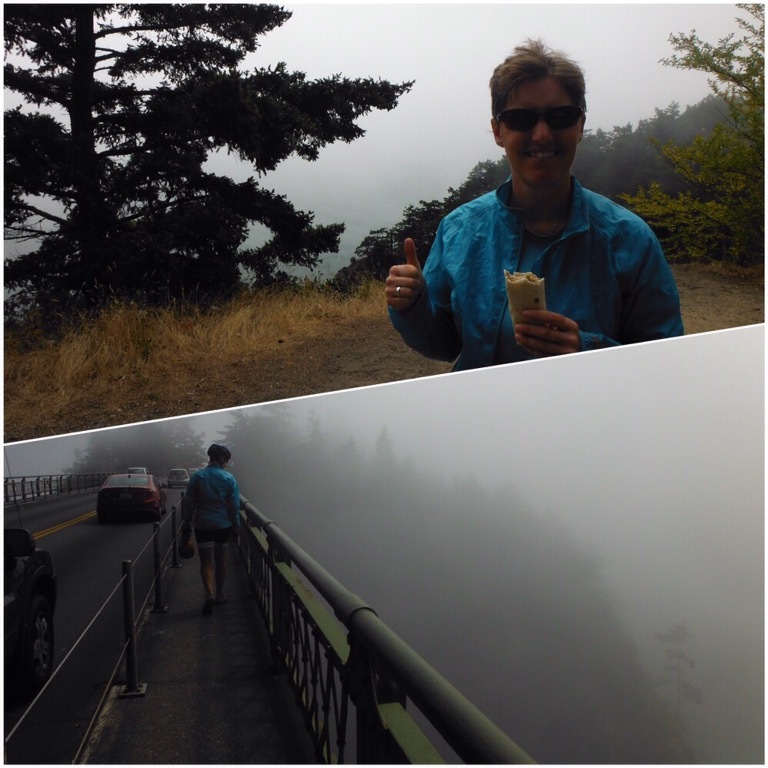 Sweating and questioning our judgement we climbed and dropped, stopped to buy a 6-pack of beer, climbed and dropped some more and arrived at Deception Pass only to find it completely covered in fog. We couldn’t see an amazing view; we could hardly even see the sea. This would not do as the finish point. So we ate a quick lunch and rode on. The road on the West of the peninsula looked to be right along the sea, but as with many places in North America a strip of private land with waterfront properties kept us away from the edge. 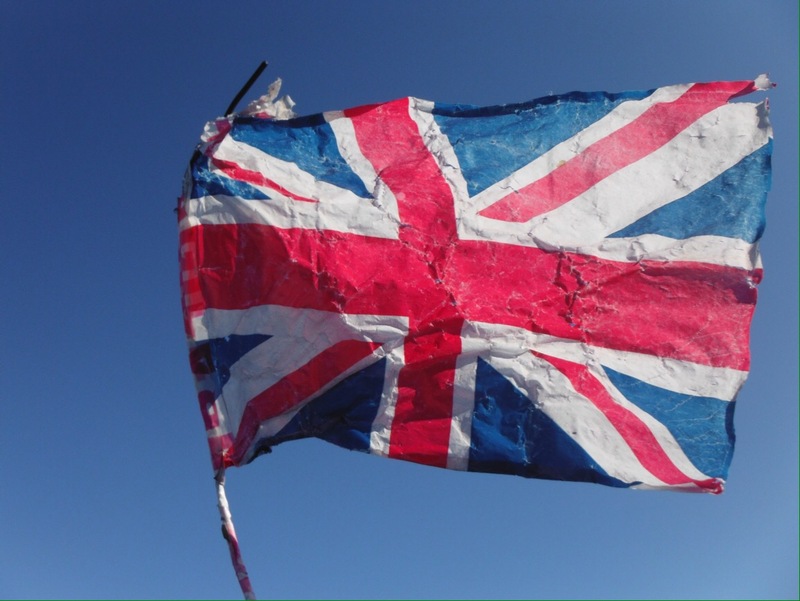 There was a beach marked on the map – we aimed for that only to find that was private too. The road was steep and hilly, it was boiling hot and the day was slipping away from us along with our dreams of having a few hours to relax with a cold drink. Finally we came across a vacant lot with a ramp down to the water, facing out to the ocean. Not ideal but we could touch the water with the bikes. So we wheeled them down the ramp and got our coveted picture, almost losing the heavy loaded bikes to the ocean. But we had made it. The end of almost 5000 miles across the USA was a steep concrete ramp on an empty scrub of land that we had to climb under a very heavy chain to get to. This was not quite how the “end” had been played out in my head over the past week. And as we were trespassing we thought this probably wasn’t the ideal place to sit, so we hauled the bikes back up the ramp, over the vacant lot, under the heavy chain and back to the hilly road until we found a place high up where we could sit and see the ocean and drink our beer. It was almost 5pm. Not much time for contemplation or reflection. 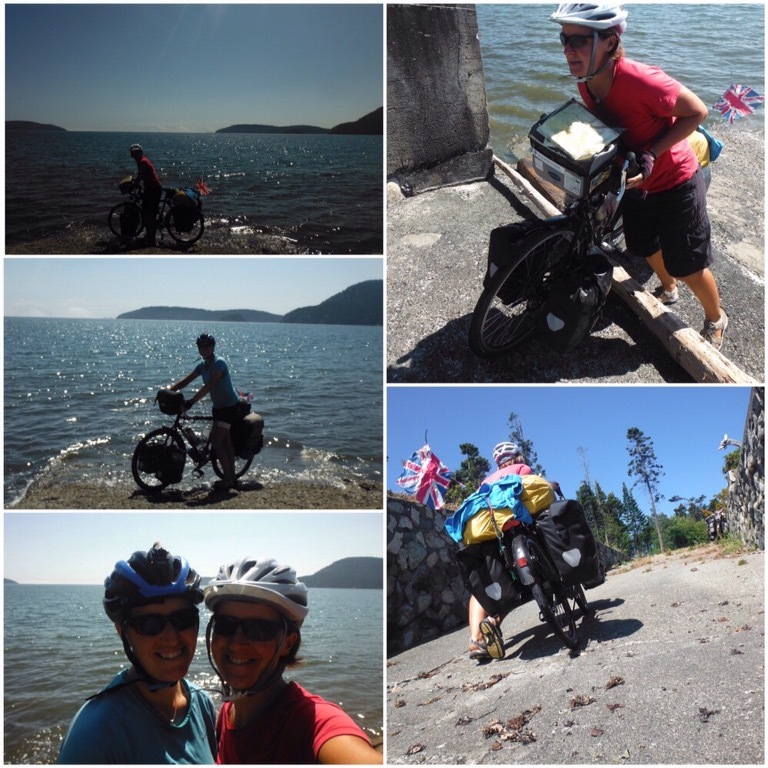 We had cycled across the huge continent that is North America. How did it feel? Just the same as any other day. We were lucky to be staying in Anacortes with a wonderful family who helped us celebrate with a big dinner and berry dessert – we had been picking roadside blackberries. The next day we caught a ferry to Shaw Island, the smallest of the four San Juan Islands that can be reached by public ferry. The island has a permanent population of about 200, has no town, just a country park and a small grocery store at the ferry dock. There are no printed maps, just a hand-drawn one at the port. The beachside campground with only 11 sites seemed like the perfect place to set up camp for a few relaxing days. A great thing about the islands is that once you have paid to get there from Anacortes, the inter-island ferry is free for foot passengers (and bicycles) so once you are there you can ferry to the other islands as much as you like for free. So we did. The first day all we did was take the ferry to San Juan Island, the biggest of the group, eat fish and chips and ice cream (separately), then take the ferry back. 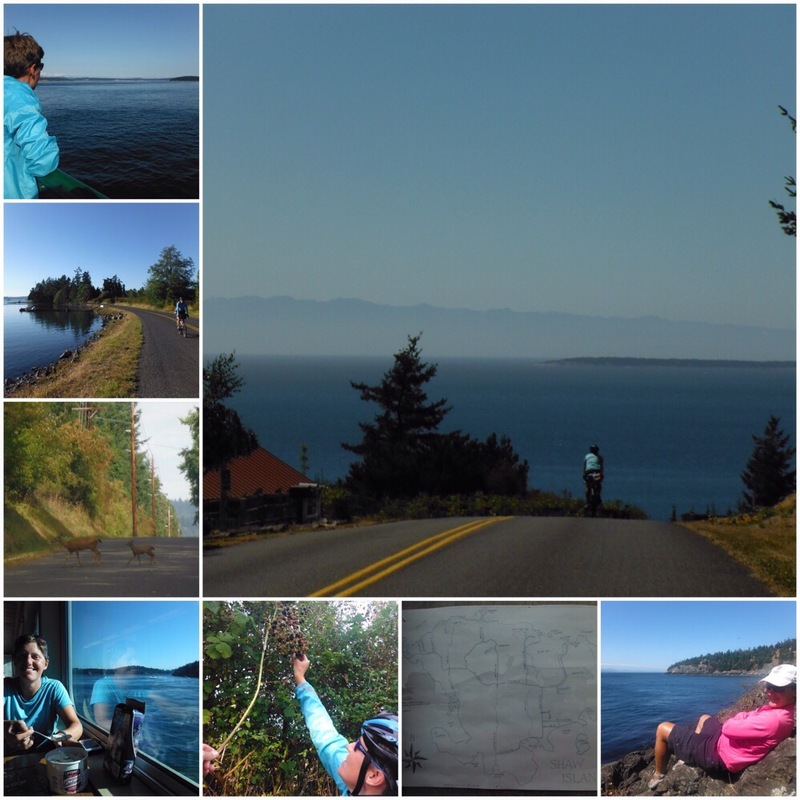 On the second day we stretched ourself a bit more and took our bikes to Orcas Island, the hilliest one, and rode up to the highest point on the islands. This was a 40 mile round trip with 5 miles steep uphill to the summit of Mount Constitution at 2400 feet. It was 8-10% grade for most of the climb, which our unloaded bikes managed without a problem. 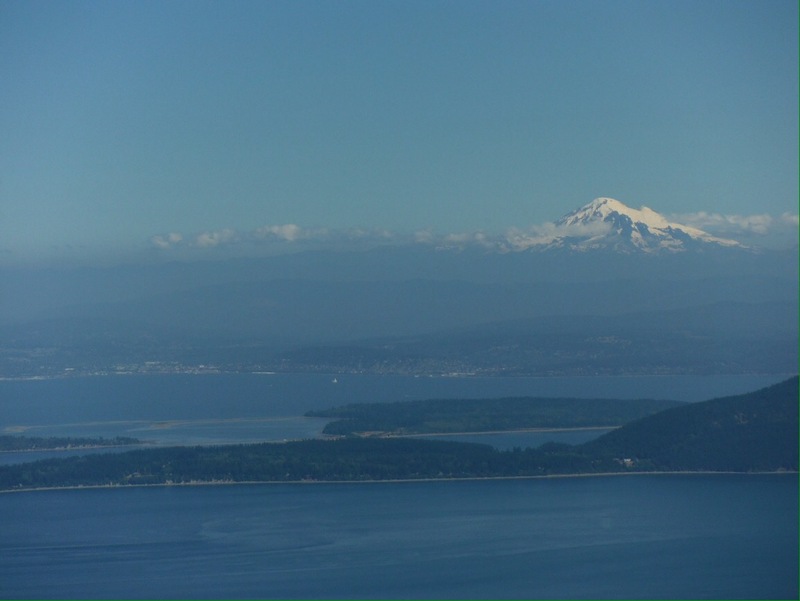 From the top the view was spectacular over the islands, and in the distance you could see the snow-covered Mount Baker back over the border in Washington. Our campground was small and quiet, and right by the beach. As with most North American campsites, it was full of people who take camp cooking very seriously. 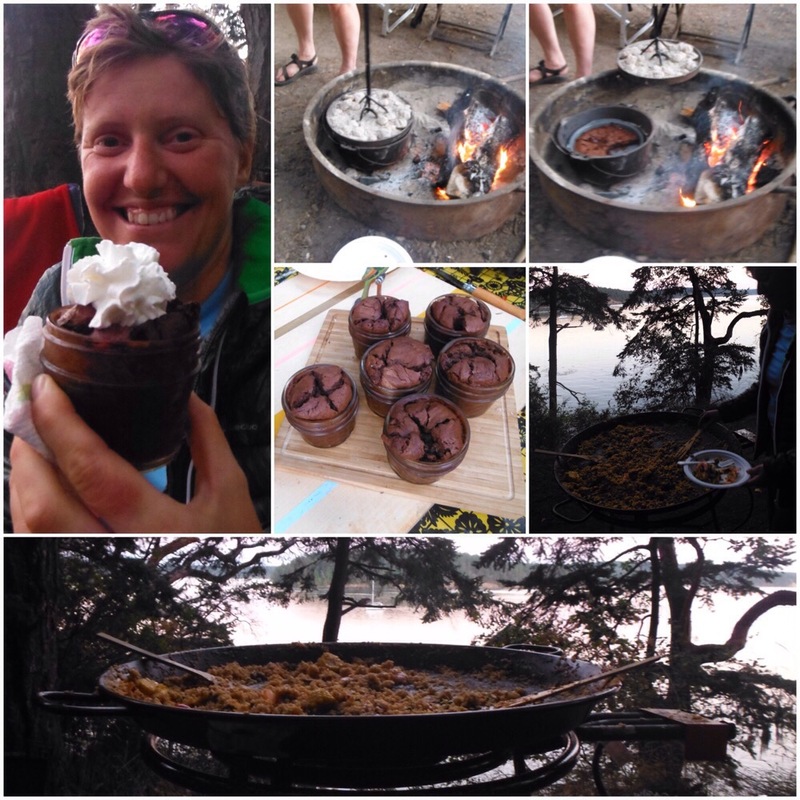 One night we were treated to paella cooked in a proper paella pan, followed by individual chocolate puddings cooked on the campfire in a Dutch oven. It doesn’t take much to beat our pasta dishes but this was some serious camp cooking, and we enjoyed testing the results. 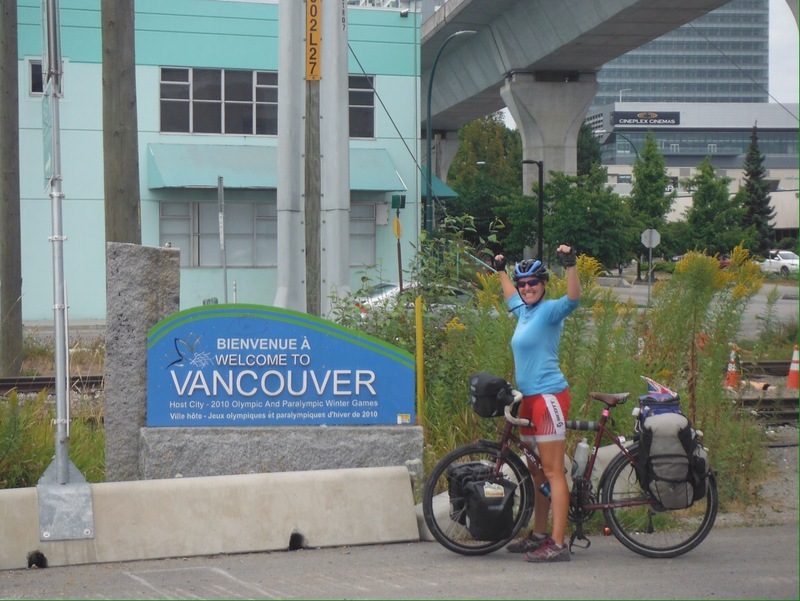 After four days it was time to head to Vancouver, a couple of days ride north. Here we planned to have a proper holiday, and hang out with people we knew for the first time in months. 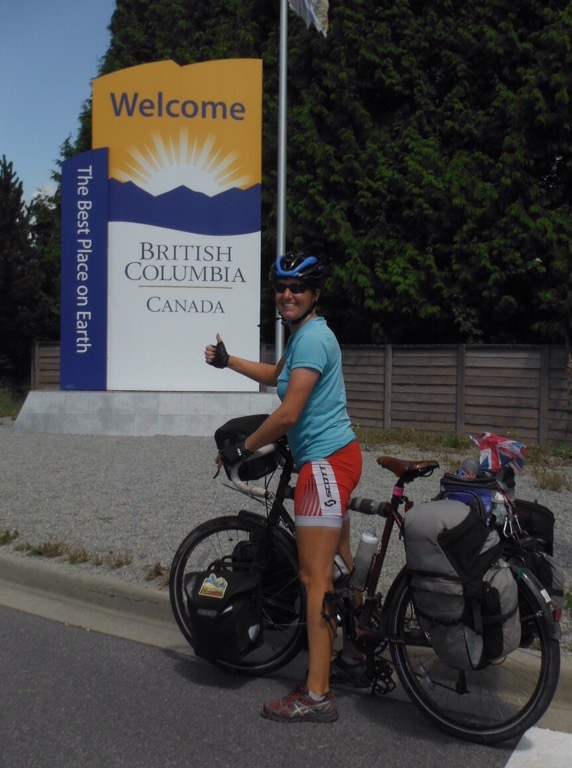 As we crossed the Canadian border and arrived at The Best Place On Earth (British Columbia is very nice, but that’s quite a claim), it felt maybe like this was the end of our coast to coast trip – a familiar place where we were going to see familiar people. Welcome to Vancouver! Thanks to Pat and Don; Jude, Carrie and the rest of Team Apple; John and Bill for so,e company on the islands; the Seattle campers for the paella and Dutch oven cooked goodies; Reid, Erin and family.